In the early days of the internet, if you wanted a little privacy, to hide your location or simply to change your IP address then the answer was simple – use a proxy server. They were all over the web, indeed they were very easy to find listed on all sorts of websites some of which were even updated hourly. Actually, you can still find them if you search, literally thousands of them appear every day in locations across the world. Although there’s still lots about, unfortunately they’re now of little use for accessing region blocked websites. The problem is that the vast majority of sites can detect proxies now and they’re normally blocked automatically. More importantly they’re often highly insecure and many of them are used to capture and steal personal information such as passwords and email credentials. No longer can you take two minutes to find a proxy server based in the UK, check a little box in your browser, hide your IP address and then access the BBC website from anywhere in the world. 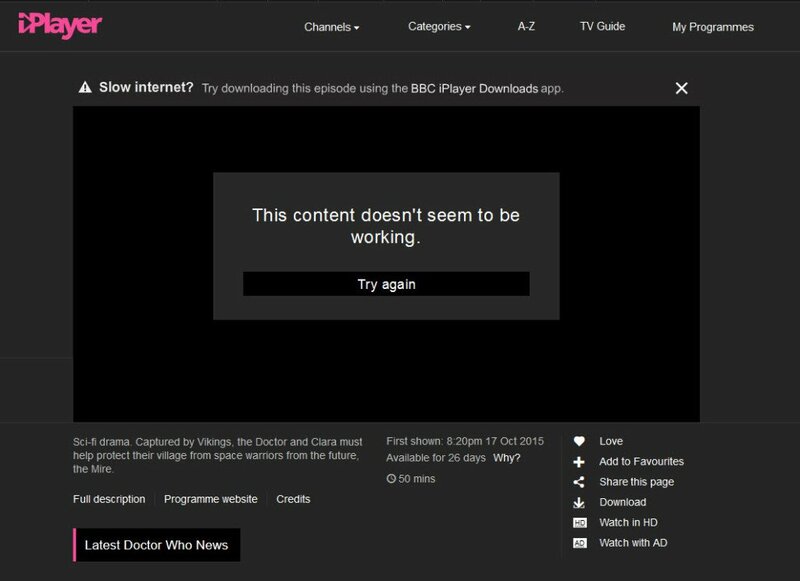 As soon as you try and connect to the BBC for example using a proxy, it will be detected and your access restricted. The same goes for all the other large media sites across the internet, all now can detect and block the use of proxies. The BBC was the last major media company to instigate this block following the example of companies like ABC, Hulu, Netflix and many others. The reality is now proxies are pretty much useless for accessing any sort of content restricted by your geographic area. Fortunately there is another method of hiding your location and accessing sites like the BBC from anywhere – you simply need to use a UK VPN connection. This stands for virtual private network and is secure, encrypted connection to a remote server similar to a proxy. Will a UK VPN Connection Allow Access to the BBC? As you can see the VPN service allows you to hide your IP address and display whichever country you need. In this example we select a UK VPN connection in order to access the BBC iPlayer website. However you can easily pick another country, such as USA for sites like Netflix and Hulu. When you connect to any web site, your real IP address is hidden and the only one detected is that of the VPN server. Which is why the best VPN services have large infrastructures with many servers spread across lots of different countries. This allows flexibility and the ability to access blocked content in different countries across the world. It’s important you use a UK VPN connection for access to the UK restricted sites as this is the only method where you can keep your real location hidden. The connection between the VPN server and your computer is encrypted and no data can be accessed. It’s also virtually impossible for the web server to detect the use of a VPN connection unlike a simple proxy. Unfortunately unlike the proxies which were often accessible for nothing, you’ll need to buy VPN access as they are extremely expensive to run. In order to work efficiently they need low contention rates, fast, available bandwidth and trained support staff to configure and maintain the servers. Obviously no one is going to finance and supply a UK VPN online for free so they’ll all have a subscription fee applied to them. Here’s a link to the trial which you can try for a few Euros. We think you’ll be impressed.